What Does God See When He Opens His Eyes? Since we are in Capernaum today – where Jesus said, “Eat My Flesh and Drink My Blood.” I thought it would be appropriate to post again this popular blog post that explains the Sacrifice of the Mass. Recently we went to Mass with two Protestants. As we walked in the door — there it was, as big as life — a CRUCIFIX with the Body of Our Lord hanging over the altar. I knew what the Protestants were thinking — I used to think the same — “CATHOLICS ARE WRONG, JESUS IS NO LONGER ON THE CROSS, HE HAS RISEN FROM THE DEAD AND IS IN HEAVEN.” Of course they think Catholics are wrong to keep Jesus on the cross as though he had not risen and ascended into heaven. Are they right? Well, YES and NO. Jesus DID rise and ascend into heaven and He IS glorified at the right hand of the Father and we are mystically seated there with him (1 Pet 3:22, Eph 2:6). 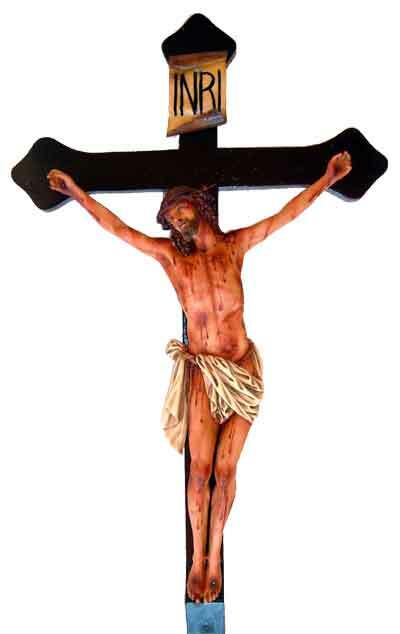 BUT the Catholic Church is ALSO correct to show Jesus on the Cross — not only to remind us of His suffering and death and to show what happens during the Mass — but because in a mystical way He IS STILL on the Cross. God the Father sits on His throne in heaven. 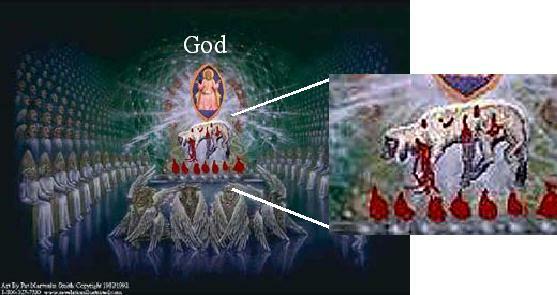 And what does God see from his throne every time he “opens his eyes”? He sees Jesus on the Cross! Really? Yeah, really! Jesus is our Passover Lamb (1 Cor 5:7). 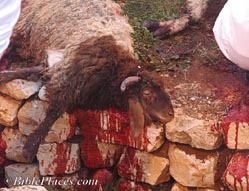 In the Old Testament the lambs were slain on Passover to save the Israelites from death. The lamb was held over the altar, his neck was slashed with a knife and the blood was drained onto the altar. This is why we have an altar in the Catholic Church! The altar represents the Cross (among other things). An Altar is where a Sacrifice takes place! Jesus was slain as our Passover Lamb to save us from eternal death and to appease the wrath of God. That sacrifice is re-presented at the Mass (see my talk Defending the Eucharist!). Who IS the slain Lamb that is still standing? Jesus is the Lamb! Standing on a altar before the throne of God the Father is a Lamb still bearing the wounds of slaugher. Jesus is that Lamb and he still bears the wounds of His sacrifice. That is what God sees when He “opens his eyes” — Jesus the sacrifice — Jesus on the altar — Jesus on the Cross. Charles Wesley, the great Methodist minister and hymn writer agrees. In his hymn “Arise, My Soul, Arise” in which he says the very same thing in very poetic terms. But wasn’t Jesus crucified once and for all, never to sacrificed for sins again? Yes, of course! In space and time Jesus was crucified once and for all in AD 30. But in God’s eyes the sacrifice is an eternal event and in the Mass that one sacrifice again is made present for us in space and time. What a gift from God! !